USDA Hardiness Zone: Zones 4 to 8. This tree has wide range of temperature tolerance. Growth Habit: Small to medium sized tree that is nearly as wide as it is tall with a height of 30 feet by 25 feet wide. Leaves: Alternate, pinnate or bipinnately compound, 6-18″ long, 7 to 15 leaflets. Each leaflet is 1 to 4″ long. Leaves are bright green with coarsely serrate margins. 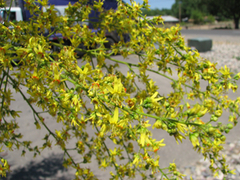 Flowers: Very showy, yellow fragrant flowers in late June to early July. Fruit: Papery, 3-valved capsule. 1-1/2″ to 2″ long. Start light green and mature to light brown color as the summer progresses. 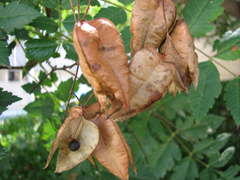 The lantern-shaped seed pods add an interesting feature to this tree in the summer. There are three dark round seeds in each capsule. 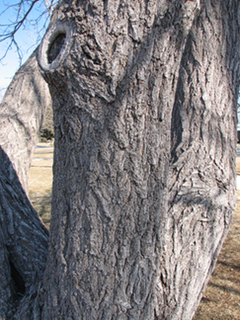 Bark: Light gray-brown, ridged and furrowed on older trunks. 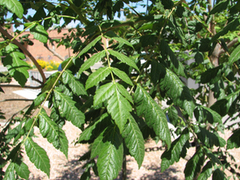 Landscape Value: This is a hardy small to medium-sized tree for yards and open spaces. 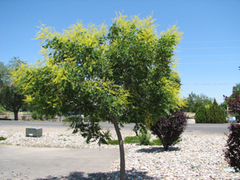 It can be used as a street tree where there are larger planting strips. The yellow flowers and unique seed pods make this tree attractive in more than one season of the year. In 2002, when a record setting drought hit Western Colorado many tree species suffered leaf scorch and overall decline. The golden raintree did not show any ill effects from this drought, which shows how tough this tree can be. There are several cultivars listed in the reference material. However, most trees observed in the Colorado landscape are seedlings. Insects and Disease: No serious pests have been observed on this tree.